The 9th Annual A Rare Affair – Triumph of Taste will be held at The Briar Club on Wednesday, February 20, 2019. This year’s event is a nod to the legendary 1976 “The Judgement of Paris” wine competition when several California wines unexpectedly bested many of France’s most highly renowned vintages. Experience the decadent flavors of California and France through a delicious meal prepared by Chef Michael Powell, executive chef of The Briar Club. Guests will also enjoy palate-pleasing California and French wines carefully selected by Sameh Nawar, wine director of The Briar Club. It will be a true celebration of food and wine! 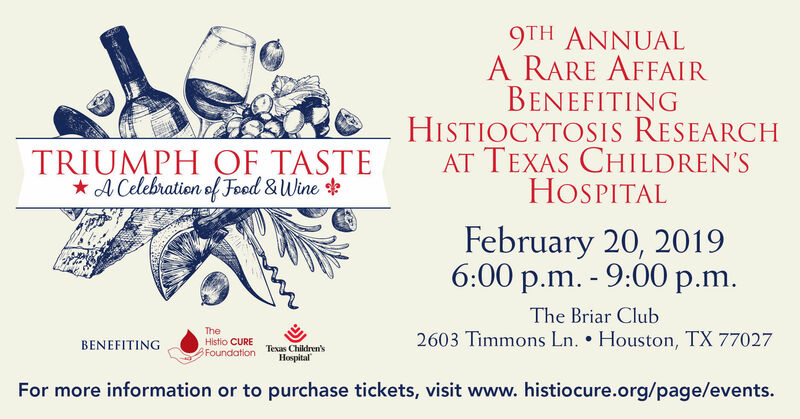 A Rare Affair – Triumph of Taste directly benefits the Histiocytosis Program at Texas Children’s Hospital Cancer Center (TXCH), the world leader for research and treatment of Histiocytic Diseases. This group of rare disorders affects both children and adults and is characterized by an over-production of white blood cells. Histiocytosis can lead to organ damage with long-term disabilities, and in the most severe cases, even death. We invite you to join us as for A Rare Affair – Triumph of Taste. Your support will ensure continued momentum to find a cure for Histiocytic Disorders. We look forward to seeing you there! The Histio CURE Foundation has partnered with Give Lively to securely process your online donation. This transaction will appear on your credit card statement as "The Histio CURE Foundation". This transaction is subject to Give Lively's Terms and Privacy.